Introducing Intel's most powerful desktop processors, the Broadwell Extreme - A new world of gaming dominance and incredible content creation. Intel's first 10-core processor for desktop PCs is the ultimate tool for delivering unrivalled performance and is our most powerful desktop processor ever. Whether you're gaming, exploring virtual reality, or creating fabulous content, the Intel Core i7 processor Extreme Edition gives you the computing power you need to do it beautifully. With Intel Core i7 69xx/68xx processor family you can run several CPU–heavy programs simultaneously, without sacrificing performance. Your PC is your studio: produce amazing 4K or 360-degree videos, stunning photos, or amazing music. With a processor that has up to 10 cores and 20 threads you can do it all. A 35% improvement in multi-threaded 3D rendering speed versus the previous gen and up to 2x better multi-threaded 3D-rendering performance versus Intel's latest 4 core processor means you can spend more time creating and less time waiting. Experience fast video encode, image rendering, audio production, and real-time previews that you can check out on a bank of monitors at a great resolution. Lag will not be tolerated: Play. Broadcast. Record. Win... in 4K. 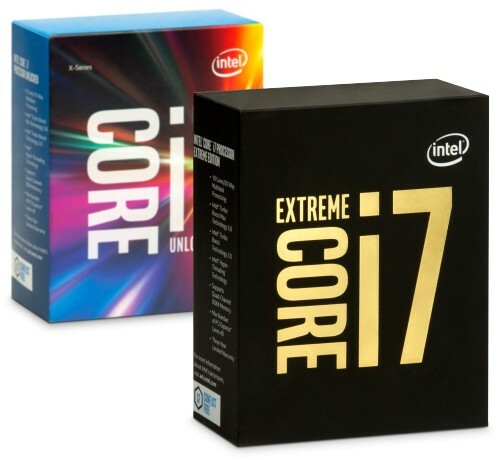 Get gaming superpowers with the Intel Core i7 processor Extreme Edition, which features Turbo Boost Max Technology 3.05 for more than 15% better single-threaded performance, blistering 2400MHz memory, fully-loaded up to 25 MB of Smart Cache, and up to 4 discrete graphics cards working together for your most demanding games. The Intel Core i7 69xx/68xx processor family is unlocked to provide additional headroom. New features include the ability to overclock each core individually, AVX ratio controls for more stability, and VccU voltage control for extreme scenarios. Combined with tools like Intel's Extreme Tuning Utility (Intel XTU) and Extreme Memory Profile (Intel XMP), you have a powerful kit for maximising performance.